How Many Pounds of Infill Do You Need per Square Foot of Turf? Artificial turf can be a daunting subject. Artificial Turf comes in all shapes and sizes and these different sizes, textures and technologies can quickly become intimidating on the surface. Then add in the conversation of proper infill depth and weight and things begin to feel even more confusing. But don’t fret! We are here to help! To better understand the correct amount of infill to use on your artificial grass application, we must first start with the types of turf. 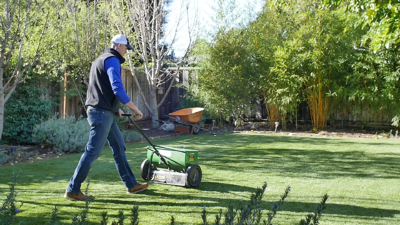 Are you installing a landscape turf, putting green or a sport turf? Using the graph below, we make it easy for you to understand the proper depth and pounds for any given installation. Envirofill Size Turf Pile Height Turf Spec Depth Lbs. Per Sqft. As you can see the proper amount of infill is completely dependent on your application. For most residential landscape application, the safe bet is between 2.5 and 3.0 lbs. of 12/20 Envirofill per square foot. If your installation will be shared with several canine companions you may want to veer toward 3-pounds per square foot. For putting green applications, it is important to understand the difference between a texturized installation and a sand filled installation. A texturized putting green is manufactured with a short pile height, about a half an inch. For a texturized putting green 2-3 lbs. of Envirofill 30/50 per square foot is appropriate. A sand-filed putting green is manufactured with a taller 1”- 1 1/4” pile height and demands more infill for proper playability. For these applications it may require as much as 6-7lbs sqft of round raw sand ballast topped with ½-1lb of 16/30 Envirofill per square foot. If you are ever unsure about the proper amount of infill for your artificial grass installation, it is wise to refer to the manufacturer of the artificial grass’s product specification. You can usually find this document on the manufacturer’s website. Finally, we are here to help! If there is any question pertaining to proper depth or weight of infill application, please reach out to us. We are your infill experts and always just a phone call away!